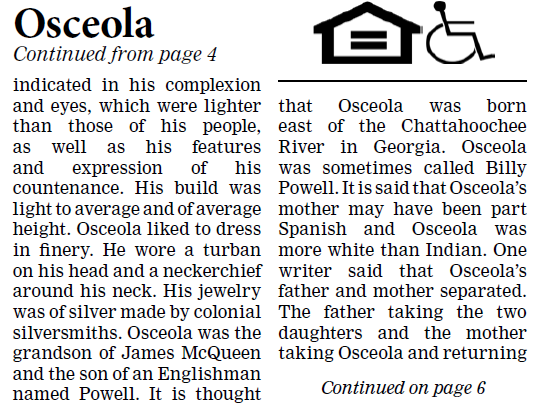 The News Times in Fair Bluff, NC recently ran an article about Osceola, a Seminole Indian Chief who was born to a Creek or Waccamaw mother. 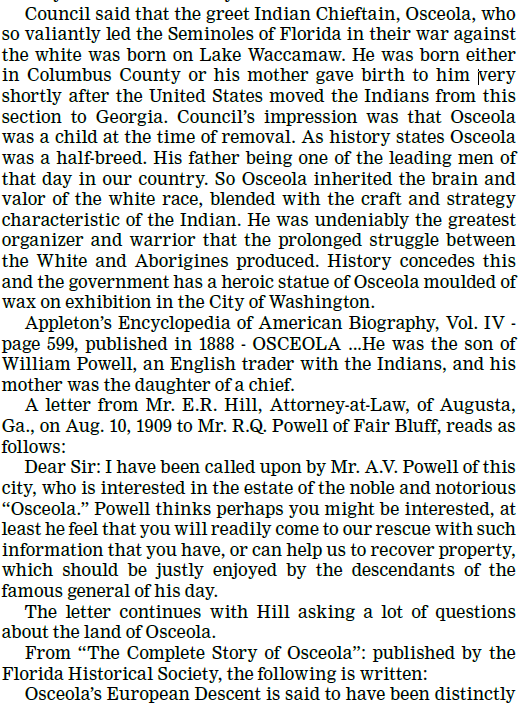 His white name was either John or Billy Powell, depending on who is telling the story, and he is often referred to as Osceola Powell. 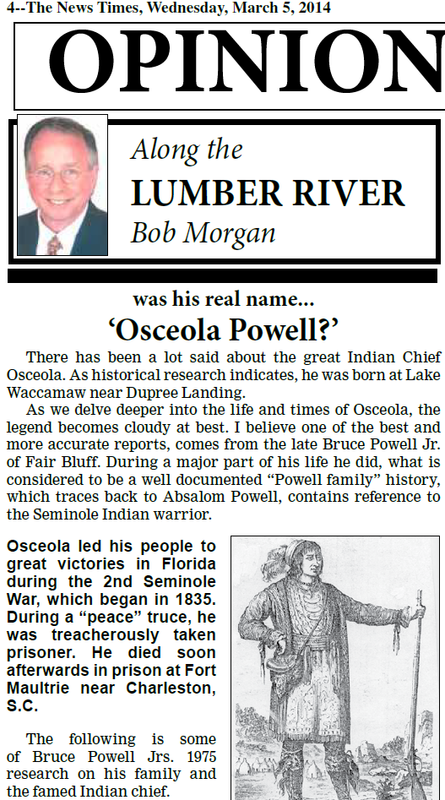 Bob Morgan researches Osceola and turns to the Powell family historian for more information. I want to say a special thanks to Stevie, one of our subscribers for sending me this story, and for his assistance in obtaining permission to print. I also want to thank Allen Turner at The News Times/The News Reporter in Chadbourne, NC for his permission to reprint. 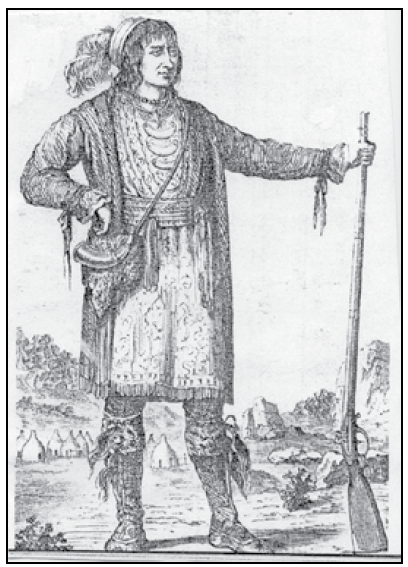 I have another article about Chief Osceola that I will be publishing soon. This entry was posted in Creek, Seminole, Waccamaw. Bookmark the permalink. I would love to find out if this Absalom Powell was my ancestor .My great grandmother was Minnie Bass Powell born in NC . I am a desendent of Absolam Powell, Sr.
My father’s mother was Nannie Powell. Her father was Absolam Powell. 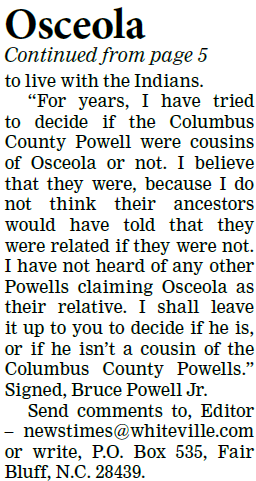 I have always heard Osceola was born at Lake Waccamaw. I have a portrait ( and photograph ) of my father, Raymond R. Renfro and a photo of Absolam Powell. Judging from the portrait of Osceola by Catlin, there is a family resemblance. My husband ‘s 5 times great grandfather was Absalom Powell. We found his grave at Western Prong Baptist Church in Whiteville, North Carolina. We are doing a lot of family history research. My husband’s name is Ronald Powell Suggs, Effingham, South Carolina. I have. 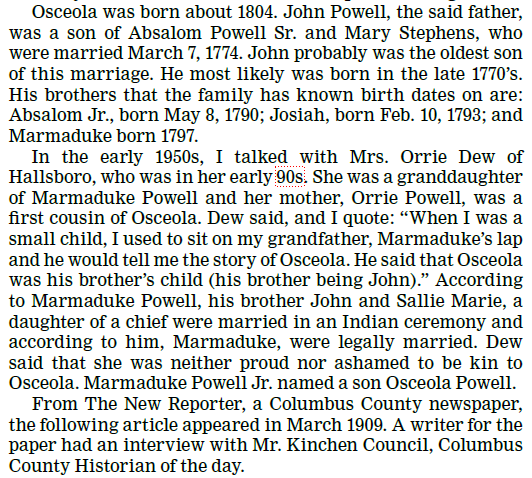 Question if anyone has information the story I heard is Osceola had given one of hi daughters away to the Robert family one of which whom married her and her name was Mary and they had a daughter Eula Mae Roberts who was my grandmother. Can any one validate that story? I am Benjamin Powell. 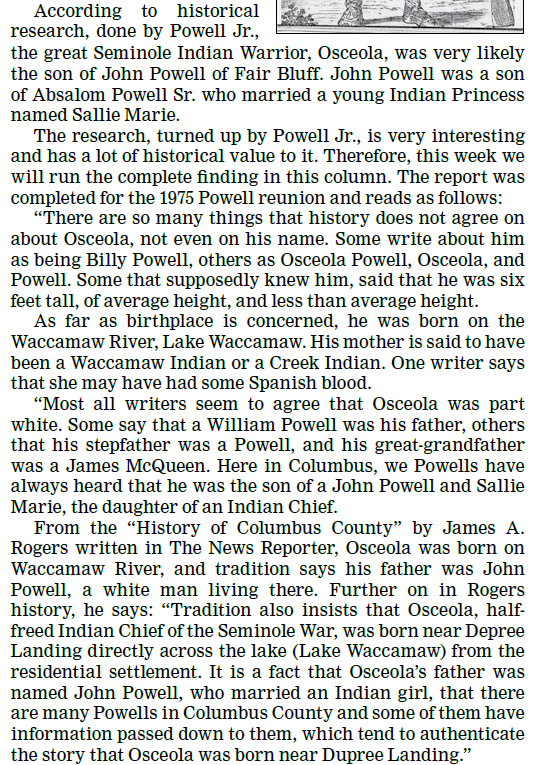 ( 4x )Great Grandson of Chief Osceola aka Billy Powell or John William Powell Jr. I recently discovered this in our family history. What am I? Creek? Seminole? Poarch? Muscogee? This is confusing. What tribe do I belong? We have our family Dawes numbers. Am I eligible for Tribal membership? Wow, hard to tell. Poarch Creek say enrollment is closed, I contacted Muscogee and James McQueen is in their book as Seminole, I found a lot that said he was Muscogee Creek. Seminole Tribe of Florida want a quarter blood quantity. Have a Seminole Of Oklahoma packet coming soon. My 4x Great Grandfather fought to protect the Seminole so maybe that’s my starting point. Poppaw Billy’s spirit has been moving me to do this for ten years and I wasn’t ready. Does anyone have all of Osceolas Children’s names? I keep finding Unknown Seminole Child as listed. I have family Photos. Billy’s son is my 3x Great Grandfather. Is he in any rolls?